Credit Unions are co-operatively managed “run by you, for you” organisations. We offer savings and loan accounts starting from just £50 and are owned by our customers/members and work for their benefit. SurreySave Credit Union is run by a small friendly team operating from an office in Woking and online. Whether you want to consolidate more expensive borrowing, in financial hardship or wish to save with an ethical organisation, the team are happy to help. SurreySave is governed by the Financial Conduct Agency (FCA) just like a high street bank and your money is protected under the Financial Services Compensation Scheme (FSCS). We are a long established local charity (Charity No. 239115), our purpose being to provide financial assistance to people living within the parish, who are in financial hardship. Traditionally providing regular payments to the elderly who are on a limited income, we would also like to hear of anyone else in need of assistance. We also give one off grants to younger people, who may need help to buy a particular item, such as a buggy or washing machine. If you feel that you qualify for financial assistance, or know of someone eligible, please contact us, using the information above. Accessible minibus providing services for all parishoners of Shere, Wotton & Abinger in Mole Valley and Guildford. Covers Dorking, Forest Green, Holmbury and Abinger Common. Also available for hire. Call to reserve a seat on any scheduled run and obtain information about times of pick up. It is recommended that seats be reserved in advance for all shopping trips. 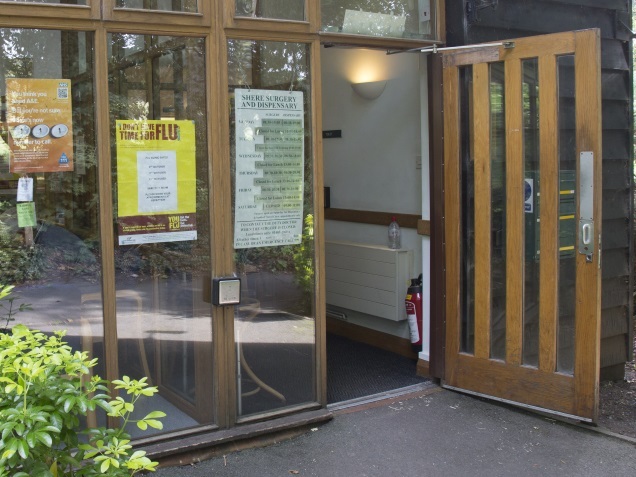 Shere Surgery is a rural dispensing practice serving 12 local villages covering a 45 square mile practice area. We have a strong team of doctors with a broad spectrum of expertise, working with our practice nurses who carry out “routine” care, such as blood pressure.